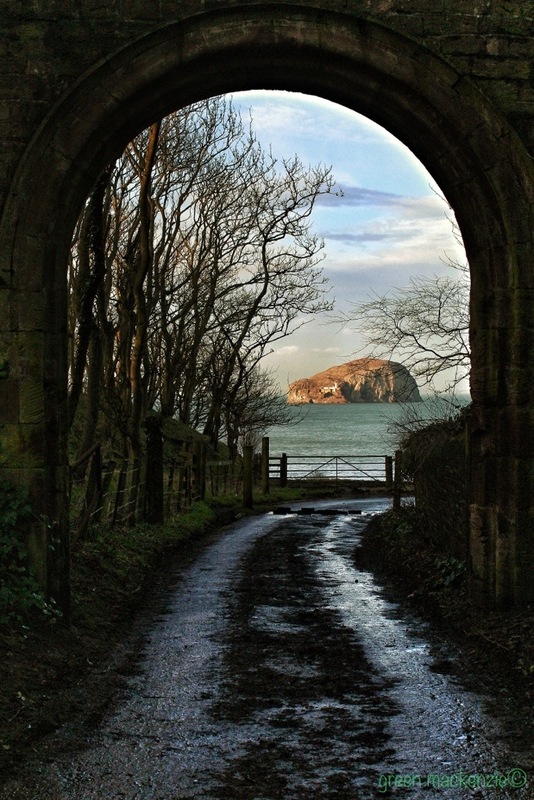 We drove down this track last weekend, to visit the secluded beach of Seacliff, in East Lothian. We took several wrong turnings, and got hopelessly lost several times before rounding the corner to this view. The Bass Rock gleaming in the Firth of Forth beckoned us forward. The beach was just through this arch, round the corner and down the track. This view led us forwards, knowing we were on the right track…..and you can see some views of the beach we reached on my earlier post ‘Breath of the sea’. Things which entice and encourage us forwards are so important, they can help to motivate, focus and reassure us. Like little beacons in the dark unknown, they illuminate and show us the path. We can begin to feel certainty in the midst of uncertainty, just because of these tangible, visible markers. They confirm we are heading in the right direction, even when we feel utterly lost. “Do not seek to bring things to pass in accordance with your wishes, but wish for them as they are, and you will find them.” Epictetus C5th. He reminds us that sometimes the best way forward, especially if we are lost, is to stop trying to find what we think should be there, and to start seeing what’s actually there. Once we had spotted the Bass Rock we knew we could relax and just follow the track. To see more ideas on the weekly photo theme of ‘forward‘ click the link. This entry was posted in change, nature photo, philosophy, photos, spiritual, weekly photo challenge and tagged change, life, lost, nature, philosophy, photography, postaday, spiritual, uncertainty. Bookmark the permalink. This is a great photo! Nice exposure and composition. It just pulls me in to the picture. Wow – this is a stunning composition! Thanks….I love it when a composition comes together 🙂 loved your photos of fun in the snow. This is beautiful! I’ve never been to Scotland…but hope to visit some day! I’m biased of course, but it has so much stunning and varied scenery, that it would be a shame not to visit! Where do you live? Thanks Carl, coming from you that’s awesome feedback 🙂 your shots are always amazing. Your so welcome, and thank you as well. Great composition and great location! It really makes you want to go there… now. The light on the rock is beckoning! Worry begins when we look beyond the present. We can dream forward and walk the long road ahead. Thanks 🙂 as soon as we saw the arch I knew it would be a good picture, but it turned out even better than I’d hoped. Indeed, it beckoned us on through the arch and into the sunshine…. Great composition and I liked your narrative too. Good post. Loved your post and the photo! What a beautiful location! And a great picture. What a great shot! Even though it seems to be winter there (from the lack of leaves), it appears to be an inviting place to wander around and discover…. coming from the winter doldrums here in Virginia, USA. P.S. Looking forward to a Scotland trip this August – my first time there. But you’re also right about how inviting this woodland is, especially on a sunny day. You can read a little more about this ancient woodlands history on my previous post ‘the sun kissed the earth’, if you’re interested. Where about in Scotland are you visiting in August? Near Findhorn… for a writer’s retreat… can’t wait. Oh Findhorn is an amazing part of Scotland….and such a wonderful community of creative people….you will love it I’m sure.